The 4 papaya plants shown on the right were planted a year and a half ago in February from seed sown directly in the ground (not my prefered way to plant anymore, see below). The parent fruit is of a Mexican variety named Maradol, which has a red colored flesh, and can be frequently found locally in super markets. Having survived one winter, with some frost protection on the coldest nights, these plants will surely be fruiting soon. In the recent past I had a single papaya plant that produced golf ball sized fruit after its second winter. Unfortunately, it was a female papaya so the fruit did not get pollinated and dropped before becoming ripe. That papaya tree was killed on an extremely cold night in January of 2007. These papayas are planted on a mound on the SE quadrant of my peach tree, to the north of my tangerine tree, 20 feet east of the house, and 10 feet west of a block wall. Being close to all of these objects puts these plants in and out of the shade throughout the day, which is actually less than ideal. More sun is better, with the exception of late afternoon sun in the summer, and these plants would be much larger at this time with more sun. Notice that a trench can be seen on the right side of the picture, right near the end of my pet cockatiels tail, and that the papaya plants are planted a little higher than the surrounding ground. This trench is a little over 2 feet from the base of the plants and has a bubbler coming up in the middle of it. The reason for this is that papayas do not do well when watered right below their leaves and up to their trunk. They are much healthier when watered at a distance, so that the their bases do not get soaked. In the past, I killed lots of papayas before I discovered this simple change in watering technique. Being on raised ground further aids in keeping the papayas roots dry. Worth noting is that I tried a Babaco papaya one time. It grew great until summer, and then quickly died. I believe it is too hot in Phoenix for that variety. Papaya plants are one of the most challenging tropical plants to grow in the Phoenix area. They are susceptible to freezing and root rot in the winter, and are also very picky about the method and frequency of watering. Papaya plants grow best when they get a lot of sun, but still benefit from shade in late afternoon in summer. They are heavy feeders but salt sensitive and therefore benefit from a steady supply of mulch to provide nutrition. Getting enough plants to survive to get adequate cross pollination can also be a challenge. With all of this being said, keep in mind that when papayas fruit they fruit a lot, so one good season can make it all worth while. Some very impressive success growing papayas can been seen in the Phoenix Tropical's forum at this link Bob's Papayas. Bob lives in Mesa and sometimes brings in bushels a sweet delicious papayas to the AZ Rare Fruit Growers meetings. There are possibly thousands of varieties of papaya in the world. In local stores generally available are two distinct classes, the Mexican papayas with red flesh and the Hawaiian papayas with orange flesh. The best varieties of each are called Maradol and Solo respectively. 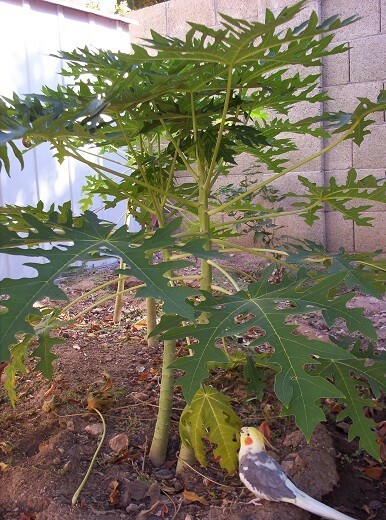 Mexican papaya plants are a little bit better adapted to Phoenix than the Hawaiian varieties. They take both the heat and cold slightly better. As for the taste, it comes down to personal preference. I find the Maradols to be my favorite because they have a brown sugar flavor, but many people like the Solos better. There are definitely some Mexican papaya varieties that have a very strong papain flavor which is what some people find objectionable, but the Maradol is not one of these. The most strong tasting Mexican varieties are typically the ones with really huge fruit as well. Papayas require cross pollination between male and female plants to fruit. Papayas also have a hermaphrodite (both male and female in one flower) gender which is self pollinating. When planting a seed or seedling it will not be evident which gender one has until it flowers. For this reason, to increase the likelyhood of getting fruit it is best to plant a number of plants. The link at the bottom of the page to the University of Hawaii shows photos of what different genders of flowers look like. Male plants are actually rather rare and are very obvious because they are the only gender which does not grow its flowers along the main stem. Male flowers grow in sprays on a separate branch. Papaya plants take the heat well and will grow in full sun. Although, I do prefer to give them late afternoon shade, because they take less of a beating in summer, and won't need quite as much water. Overall, Papayas will flower and grow best if they get more than half a day of direct sun. With adequate water, papaya plants tolerate the hot dry summer months, but thrive much more when the humidity goes up in months such as July. The majority of fruit production occurs in the fall and spring. Papayas can survive a very light frost but they are very susceptible to temperatures below freezing. They should be covered with frost cloth if temperatures at night are going to go close to 32 F. It is important to cover the plant all the way to the ground to trap heat radiated from the ground at night. An external source of heat, in this frost enclosure, such as a light bulb, will be necessary if extreme cold is predicted, such as temperatures in the upper 20's F. Fortunately, in Phoenix, temperatures close to freezing are usually only a possibility from the middle of December until the end of January, and extreme cold occurs only several times a decade. Some winters temperatures will never go below freezing, but temperatures can vary greatly depending on where in town one lives. Since papayas are easily damaged by the weight of a cover, a structure should be created to support the cover. More information on protecting sensitive plants from frost can be found in the frost damage article. Papaya plants can often be found at your local big box store, and they can also be easily grown from seed. Buying a two foot tall plant at the store will put you about six months ahead of growing one from seed. To grow from seed, purchase a fruit from the store of your favorite variety, or buy some seeds online. For seeds from a fruit, separate out the seeds and rub them between your hands to help break the gelatin bubbles surrounding the seeds. Plant the seeds in about a half inch of soil. If planting in a pot, any well draining potting soil will do. If planting in the ground, use the native soil and plant as many seeds as possible, several hundred per fruit are typical, and plant in late February. Water planted seeds carefully by hand, keeping the soil moist but not soaked. Papayas plants grow very quickly at first but then linger for a long time once they reach about 6 inches in height. Possibly they are growing their root system during this time so one has to be patient. Proper watering is the most critical part of keeping them healthy and growing. Even though papaya seeds can be sown directly in the ground, my current philosophy is that the quickest results can be obtained by growing papaya trees as large as possible in a pot before setting them out. Pots are easier to have ideal drainage in and can be moved inside during frosty nights. A plant about 3 feet tall in a 3 gallon pot is a good transplant size. Any larger than that and the plant will begin to get too heavy and too tall to handle. Early March is usually a good time of year to put a potted plant in the ground. To prepare a site to plant your papaya tree, make a mound of dirt at least a foot higher then the surrounding soil. This will aid drainage around the papayas roots which are very sensitive to being too wet. Do not mix compost or any other amendment in with the backfilled soil. Use straight native soil, because amendments will contribute to keeping the soil wet down deep in the soil which is detrimental to papayas. After backfilling with native soil, a thick layer of mulch should be used to top dress the soil around the papaya. This layer will provide nutrients and is helpful to reduce evaporation. Having a thick layer of mulch will allow the papaya to be watered infrequently but still remain moist. Papayas do well on a citrus watering schedule in summer. In the winter, they should be kept very dry due to their tendency to develop root rot in cool weather. Papayas should not be watered directly at their base, but instead should be watered at a distance of several feet using a trench as shown in the above picture. It is best to plant them on a mound at least a foot higher than the level at which they are watered. Papayas are fast growers and heavy feeders, but they are also salt sensitive. I have found that chemical fertilizers appear to work well on them at first, but as the soil becomes saltier, from the chemicals, the plants will begin to take a beating and will stop growing. Therefore, it is best to heavily mulch papayas to supply the nutrition they need. Well composted mulch can be mixed with small amounts of greener mulch to supply extra nitrogen. Papayas are grown from seed.